WORK FOR YOURSELF (BUT REALLY FOR AMAZON). Amazon is looking for a partner. Well, more accurately, lots of little partners. On Thursday, Amazon launched its Delivery Service Partner (DSP) program, which will encourage entrepreneurs to start small Amazon delivery companies. Each entrepreneur will oversee 40 to 100 employees who will use 20 to 40 Amazon-branded vans to deliver packages year-round, using Amazon’s own logistics systems to facilitate the process. Start-up costs for a DSP business are as low as $10,000, and military veterans can apply to have their start-up costs reimbursed. Amazon claims DSP companies can produce annual profits as high as $300,000. MO’ PACKAGES. MO’ PROBLEMS. Right now, UPS, FedEx, and the U.S. Postal Service deliver most of Amazon’s packages. But Amazon will need a lot more delivered, and soon. 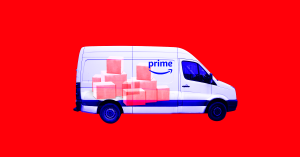 People familiar with the matter told The Wall Street Journal that established delivery companies simply can’t keep up with Amazon’s projected growth. This has led the e-retailer to start looking inward for a solution to its delivery problem, first through Amazon Flex, which allows drivers to use their own vehicles to deliver packages — think Uber or Lyft, but with packages instead of people — and now with the DSP program. WIN/WIN/WIN? On paper, the DPS program seems like it could benefit Amazon, Amazon’s customers, and American workers. According to Amazon, the program won’t take work away from existing delivery companies (“There’s so much growth here in parcel delivery that there’s more than enough for everybody,” Amazon’s senior vice president of world-wide operations Dave Clark told The WSJ). It could also improve Amazon’s relationship with customers. In 2013, customers who expected to receive Amazon packages in time for Christmas found themselves disappointed when both UPS and FedEx missed delivery deadlines. Amazon ended up offering refunds to customers — a situation it would no doubt like to avoid in the future. The DPS program also has the potential to create “tens of thousands” of jobs. Let’s just hope Amazon delivery drivers are treated better than Amazon warehouse workers.